Justice League #16 Review – AiPT! ‘Escape from Hawkworld’ concludes with big reveals. 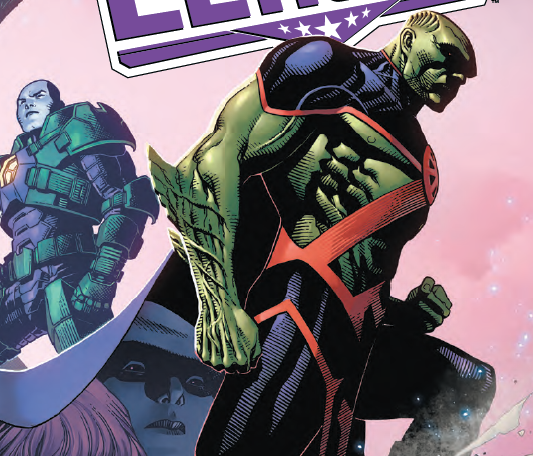 The last few issues of Justice League have been leading up to this issue, as Martian Manhunter, John Stewart, and Hawkgirl attempt to get some answers. There is plenty of opposition standing against them, including a handful of Green Lanterns and some reality-altering powers afoot. Just another day for a Justice League member. It’s a mystery in space: Why would the Guardians of the Universe hide top-secret intel deep in the bowels of a secret vault on Thanagar Prime? That’s what Martian Manhunter, GL and Hawkgirl want to know! That’s not the only puzzler popping off either, as an ancient connection that bonds Kendra and Shayera Hol unlocks the secret of the map on Hawkgirl’s Dark Metal wings. Back on Earth, Starman and the Trinity look to create a wormhole that could transport them to Thanagar Prime. The only catch? It could vaporize them! “Escape from Hawkworld” concludes this week and it’s filled with answers, revelations, and a brand new direction to explore. At this point, would we expect anything less from James Tynion IV and Scott Snyder? Prepare to learn a lot about Martians. It is clear at this point if you’re not reading Justice League you’re missing out on the bigger picture of where the DCU is going. This issue is evidence of that. The trick of this issue and the series as a whole is how it ties very big plot-changing elements to characters. Martian Manhunter is a key character who has revelations revealed here that change him, but also potentially change the course of the DCU. The writing in his scenes is exceptional, making it clear how his destiny connects to where we go from here. There are also some key flashbacks that help flesh things out and keep the bigger picture clear. It appears a major threat is coming that is bigger than any of these characters. Another trend in this series is the high stakes, which always seem impossible to vanquish. Tynion IV writes a good script here, creating genuine interactions. Kilowog, for instance, has good reason to be pissed at John Stewart, but through a bit of fighting and explanation, things get ironed out nicely. A good thing considering John Stewart couldn’t possibly fight off a group of Green Lanterns. There’s a bit of deus ex machina used at the end of the issue, but it suits the situation. Gods and the threat of gods are very much made a reality after you read this issue. The art is mostly by Stephen Segovia with Jim Cheung jumping in for the last few pages. Segovia stretches the layouts across two pages, giving the action more space to breathe and to play around with layouts. Overlapping characters across the boxes help draw your eye in the right way. Martian Manhunter looks fabulous too, with those beady eyes and forehead hammering home his inhuman nature. It can’t be perfect, can it? Deus ex machina is a hell of a thing, and one aspect that comes with it is the somewhat cheapened ending it brings. There are some quick convenient wrap-ups to things that don’t feel quite genuine enough. When you think a bit too deeply into these sorts of things, you realize a lot of the tension and fighting was artifice to allow characters to expound exposition and get ideas across. It’s not such a tight ship in that regard with how this ending transpires. A good issue that wraps up Martian Manhunter, John Stewart, and Hawkgirl’s adventure in outer space. If you’re not excited for what comes next, you might as well stop reading comics. It’s that good. A good issue that wraps up Martian Manhunter, John Stewart, and Hawkgirl's adventure in outer space. If you're not excited for what comes next, you might as well stop reading comics. It's that good.